On November 22, 2017, Jennifer House (co-chair CBMG) & Jennifer Peddlesden (Political Action Committee, CBMG) met with the associate health minister Brandy Payne. 1) Funding of human donor milk in postpartum units. This would save money and health of infants who are supplemented instead with formula, when required. Formula fed infants have a much higher change of hospital re-admission. 2) Mandating the Baby-Friendly Initiative in Alberta Hospitals. Currently we have 3 hospitals designated Baby-friendly. BFI supports the health of moms and babies, when supporting moms to successfully breastfeed their babies in hospitals. 3) To be a part of Alberta Health Services Breastfeeding committee, which creates the AHS breastfeeding policy and use of human milk policies. My colleague Jennifer Peddlesden also met with her MLA and UCP party member Leela Aheer about this issue. Ms Aheer was keen to move our initiatives forward. 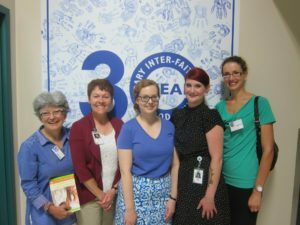 In response to CBMG Political Action Committee member Jen Peddlesden’s letter to food bank manager Dolores Coutts regarding a Calgary Herald Swerve article (see Issues link), the Political Action Committee was invited to meet with the Calgary Interfaith Foodbank. Food bank staff gave Jen House and Jen Peddlesden a full tour of the food bank on Monday 23, 2013. What an amazing operation! When touring the Baby Room, they were able to make some requests to make the Food Bank more breastfeeding and International Code friendly. The Food Bank also runs an additional Milk Program for children and pregnant/nursing mothers, supplying milk and Nestle Good Start for formula-fed babies (purchased by the food bank). 1) Exchange the Ross/Enfamil-sponsored baby magazine (with coupons) they hand out in baby baskets for an Alberta Health Services brochure about feeding baby. 2) Send address/link for obtaining “10 Tips for Successful Breastfeeding and “10 Reasons to Breastfeed” brochures free from the Public Health Agency of Canada. 3) Provide the Foodbank with a simple handout to go into baskets which have powdered formula about safe use. mixing and storage. 4) Take the baby bottle image off of the referral form for the milk program. The Political Action Committee provided Ms Coutts with some La Leche League Canada brochures with telephone/online breastfeeding help, a complimentary copy of The Womanly Art of Breastfeeding from the Calgary Chapter of LLLC, some breastfeeding rights/thank you cards from the Alberta Breastfeeding Committee and brochures from the Calgary Mother’s Milk Bank. Human rights tribunals and courts have determined that breastfeeding is an integral part of being a mother. As a result, retailers must allow women who need to breastfeed their children the opportunity to do so. Retailers who are concerned about breastfeeding in public areas of their operation may provide a private space for breastfeeding. Yes. Human rights tribunals and courts have determined that breastfeeding is an integral part of being a mother. As a result, retailers must allow women who need to breastfeed their children in a public area the opportunity to do so. Retailers should not ask the mother to cover up or move to a different location. While some retailers may wish to provide a private space for breastfeeding, there is no obligation to provide such space, nor is there an obligation for mothers to use such space. Check out our certificate from the Breastfeeding Challenge 2012! You should know your alert to us and feedback from Jennifer House and Jennifer Peddlesden at the Calgary Breastfeeding Matters Group helped us craft and then refine our breastfeeding policy last year. We agreed with your feedback that we should not need to inform a mum that there is a complaint. For Stampede 2015, we are supporting and communicating the following policy as part of any relevant onboarding. We believe that moving a complainant to other comparable seats does not endorse or show agreement with the complaint/complainant, but is a way to provide all guests with the best experience possible. Breastfeeding is an integral part of being a mother. We allow women who need to breastfeed their children in a public area the opportunity to do so. We should not ask the mother to cover up or move to a different location. We do have private spaces for breastfeeding, but there is no obligation for mothers to use these spaces. We will advise the complainant that in Canada mothers have the right to breastfeed anytime, anywhere. Generally our belief is that if someone is uncomfortable being near a breastfeeding mother he/she/they can/will move somewhere else and leave the mother in peace. If it’s a ticketed event, a supervisor has the authority (if the complainant continues be upset) to move the complaining party to other comparable seats. It can be tricky to move people but we certainly agree that’s no excuse to violate the right to breastfeed. In the past week, in our training with about 60 Stampede time supervisors, we have used a breastfeeding case study to help them understand the policy and issue. We are also using the policy as part of the training early next week with our Grandstand ushers. Thanks for your patience and feedback. I do appreciate it. A big congratulations to the High River Hospital, for receiving their certificate of participation to begin the journey of earning Baby Friendly Initiative status! You are paving the way for other Alberta hospitals! Thank you to the High River Dairy Queen for being breastfeeding-friendly! Oh behalf of the Calgary Breastfeeding Matters Group, I wanted to write and thank you for how you handled an incident in your Dairy Queen recently. A couple complained about the nursing babies around them, and asked the manager to do something about it. The manager then told the couple they could go eat in the washroom, or take their food to go. Thank you for standing up for nursing mothers and babies in your family-friendly restaurant. You are helping to normalize breastfeeding, and hopefully soon there will be no more complaints when moms are feeding their babies the way nature intended! You likely realize that provincial and federal law does support mothers to breastfeeding anytime, anywhere the mother and baby are legally allowed to be. If you would be willing to recognize your restaurant as a breastfeeding friendly location, you are welcome to display the breastfeeding symbols: www.breastfeedingsymbol.org or poster we have included with this letter. © 2017 CBMGF | Fetching Finn Inc.